Let's start by saying that breastfeeding is your best option when it comes to feeding your baby. Pediatricians say breastfeeding is best for your babies and Parent's Choice supports that. Just because we are talking about formula doesn't mean we do not support breastfeeding. 1. 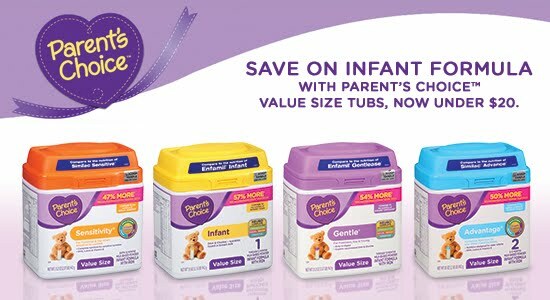 Parent’s Choice is nutritionally comparable to all the expensive baby formula brands, including Enfamil®, Similac® and Gerber® national brand infant formulas. 2. You can use the Parent’s Choice Baby Formula Finder to select the best formula for your baby. 3. Parent’s Choice is clinically proven to be as well tolerated as Enfamil® and Similac®. 4.Clinically proven to support growth and development. 5. Easy to digest and has been well tolerated by millions of babies. Parent’s Choice meets all infant’s formula nutritional standards and the recommendation of the AAP – the American Academy of Pediatrics. Higher price does not mean higher quality! You can check out all the Parent's Choice products on their website and you can purchase this exclusive brand at Walmart. Now it is time for a giveaway! Enter below for your chance to win $100 Visa Gift Card and samples of Parent's Choice. Reviewz & Newz is not responsible for shipment of prize.